March 5, 2012 - Gulfstream Aerospace announced that the Gulfstream G280 has received a provisional type certificate (PTC) from the U.S. Federal Aviation Administration (FAA). The company also obtained a PTC from the Civil Aviation Authority of Israel (CAAI). The principal remaining item required before full type certificates are issued by the FAA and CAAI is an update to the software for the aircraft?s state-of-the-art avionics. Gulfstream expects to receive full type certification from both later this year. ?The G280 will be the fastest, largest, most comfortable aircraft in its class, and we are very pleased with its performance throughout the flight-test program,? said Larry Flynn, president, Gulfstream. ?With these certificates in hand, we are now able to move forward in preparation for customer deliveries later this year, as scheduled." When delivered, the G280 will exceed the performance specifications outlined when the program was publicly announced in October 2008. The aircraft?s range is 3,600 nautical miles (6,667 km) at Mach 0.80, an increase of 200 nautical miles over original projections. Its balanced field length is 210 feet less than originally announced, allowing it to take off from runways of 4,750 feet (1,448 m) or less. That?s an improvement of more than 1,300 feet compared to the aircraft it replaces, the G200. The three G280 aircraft in the flight-test program have flown more than 1,845 hours during more than 685 flights, while the fatigue test article (F1) has completed more than 14,300 of 40,000 cycles. Additional achievements include the successful completion of wet runway, crosswind and maximum energy brake testing. Serial Number (S/N) 2003, the third aircraft to join the flight-test program, has finished the tests required of it for type certification. That aircraft will now be transitioned to the testing of optional avionics features, including the Head-Up Display (HUD II) and Enhanced Vision System (EVS II). S/N 2004, the first production aircraft, was outfitted and painted last year for an appearance at the 2011 National Business Aviation Association Convention & Meeting in Las Vegas. It is undergoing final upgrades in anticipation of its delivery later this year. PTCs have been common in general aviation programs over the past 15 years. Both the Gulfstream V and the Gulfstream G550 were issued PTCs before receiving full certification. The Gulfstream G650 received PTC from the FAA in November 2011. Since 2005 Gulfstream has been working on a follow-up aircraft, then known as the G250, which was launched in 2008, with major improvements, like new glass cockpit and engines, bigger wing, heated leading edges, and other refinements. The G250 is a derivative of the G200, with many improvements, among them increased cabin length, new engine HTF7250G, new T-tail, wing bleed anti-ice, cabin with 4 more windows and access from it to the baggage compartment. 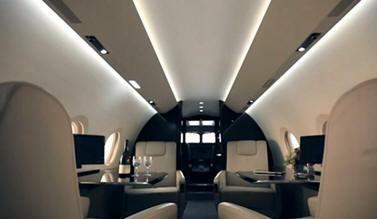 It will compete against the Hawker 4000, Bombardier Challenger 300 and the planned Embraer Legacy 500. The fuselage, empennage and landing gear will be manufactured by IAI, the wing by Spirit AeroSystems, while the final assembly will be performed by Gulfstream. The first G250 has its maiden flight on December 11, 2009 from Tel Aviv, Israel. The second G280 first flew on March 25, 2010. With this flight, the two G280s have completed over 72 hours of flight testing. The G280 is planned to receive type certification in 2011, then enter service shortly afterwards. In July 2011, the G250 was renamed the G280, as the company had "determined that G280 is a more amenable number sequence [than G250] in certain cultures.